As long-time readers know, our middle dog Rosie suffered from masticatory muscle myositis, an autoimmune disorder where her body decided her jaw muscles were a bacterial infection. She’s undergone a lot of treatment with Prednisone, and while she can’t open her mouth fully any more, she’s in far better shape than she used to be. We’ve started weaning her of her Prednisone dosage. Her breath has gotten way nasty. Like, wow. We talked to the vet about it this week and he said that might be due to her dosage reduction, it might be due to something else. Because she can’t open her mouth all the way, it’s difficult for Rosie to get all of the food from the back of her jaws. Sometimes Sedagive? and I massage her face to move food bits forward, and Sedagive? has had to resort to a toothbrush for particularly stubborn pieces. The vet suggested swabbing her teeth and gum line with a sterile gauze pad lightly treated with an oral cleaning solution. He highly recommended Nolvadent, which has a peppermint flavor. Nolvadent comes in an 8 ounce bottle. It is $58 when bought through most vet supply places, or $39 if you buy it from Amazon. The active ingredient is 0.1% chlorhexidine acetate. This is a “brand name” formulation. There is a generic formulation called chlorhexidine gluconate. They do about the same thing, although chlorhexidine gluconate is about 20% less potent per volume than the acetate version. Chlorhexidine gluconate-based products have a 0.12% concentration instead of the 0.1%. 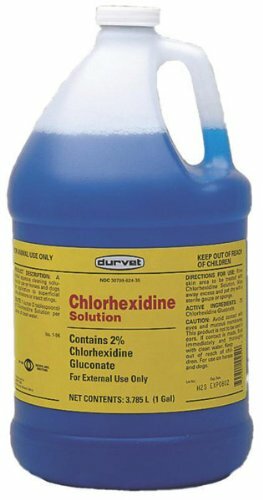 There are several products on the market for dogs and cats that feature chlorhexidine gluconate. They are about half to a third of the cost of Nolvadent. That got me thinking, though. I buy a lot of trauma gear for two-legged creatures from the four-legged critter department at Fleet Farm. Often things for farm livestock is much less expensive than for humans or pets. Self-adhering cohesive bandage wraps are a great example. I can spent about $8 – $9 on a 3M roll made for humans, or $1.99 at Fleet Farm for a roll of Vetrap — also made by 3M. Anyway, the quest for alternatives got me researching, and it looks like you can buy a gallon of 2% chlorhexidine gluconate for $29 delivered. This is way more than I need. But bear with me. According to some quick dilution rules from my sister who is is a vet professional and works at a metropolitan zoo, I can mix 60mL of solution to a 940mL of distilled water. You can get 63 60mL doses out of a gallon, or 63 liters of mix (over 16.5 gallons). Total cost for 8 ounces, not including the bottle: $0.12. Rounded up. At this rate, I’ll just throw an entire bucket in Rosie’s face and call it a day. Of course, I don’t want 16 gallons of oral rinse in the house, so I’m going to head over to Fleet Farm to see if they have a smaller bottle. And possibly, a lower price.